To maintain the visual appeal and cleanliness of your swimming pool, routine maintenance is required. Beyond adding chemicals to keep the water safe to swim in, pool managers and owners must maintain the paint coating to ensure the swimming pool’s integrity. If the existing swimming pool paint coating is severely peeling or failing, or if you have build up, abrasive blasting is recommended. Swimming pool paint and coatings removal is one of Kelso's earliest areas of expertise. 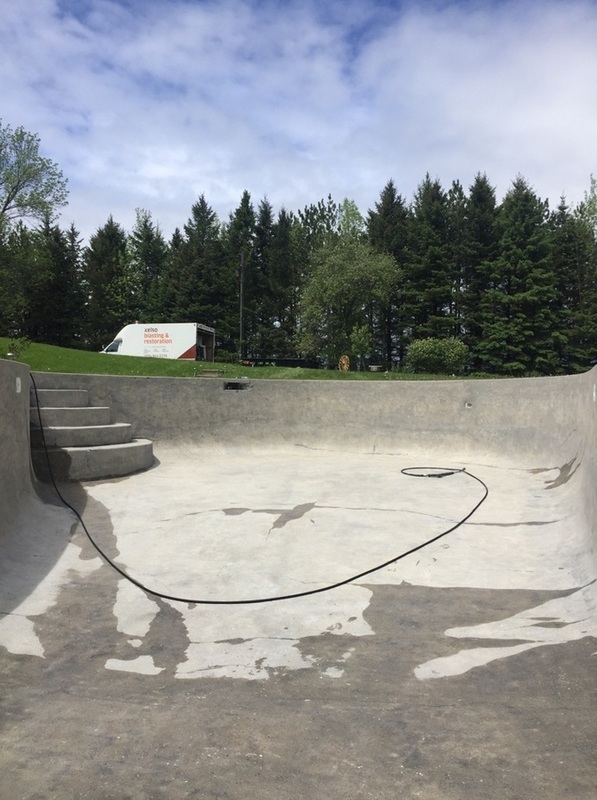 Kelso has successfully completed hundreds of swimming pool restoration projects in Ontario and across Canada that keep swimming pools looking brand new. Before you repaint a cement swimming pool, you need to remove all traces of old paint. One of the best methods of doing this is abrasive blasting, which involves using equipment to direct an abrasive medium at the pool's surface. As well as various types of sand, common sandblasting media are crushed glass, steel grit, aluminum oxide and walnut shell. Our swimming pool coating and paint removal solutions benefit both the homeowner looking to have their pool de-painted prior to repainting the pool themselves, as well as the pool maintenance professional looking for a high quality de-painted surface, with sufficient profile for good paint bonding. Whether a residential swimming pool, municipal/town pool, or a water park, our company has the staff, the equipment, and the knowledge to correctly prepare your pool the first time without any problems. Our vastly experienced swimming pool professionals have received outstanding reviews for our track record of delivering high quality work on time, and within budget. Contact us today to arrange a quote for your next swimming pool restoration project. We can provide a quote for paint or coating removal that will make your new coating apply with ease and look beauiful for years to come. With offices in Milton and Ottawa, we are happy to service not only the Greater Toronto area and eastern Ontario, but also the entire of Ontario and beyond.